The spotlights reflect on the bots' chrome surfaces. The young contestants sync up their control pads and their metallic warriors whirr to life. The crowd cheers as the arena's energy shield flares up! As fingers become a button-mashing blur, the Bot Battle begins! May the best bot win! 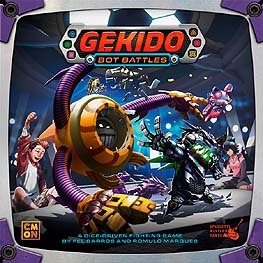 Gekido: Bot Battles is a dice-driven combat board game where 2 to 4 players control their robots in an electrifying underground arena deathmatch. The commands on your bot's gamepad are represented by rolling custom dice that you use to try and activate different attacks. Push your luck to get the strongest combos, but be careful you don't overheat the circuits. Choose among a roster of amazing pre-painted bots, each with unique powers you are able to unlock as it takes damage. The closer it is to destruction, the more vicious your bot will be!